Looking for fixed price* (including 'Buy It Now') bargains on eBay? ...you need 'Buy Now Search', an eBay search tool. ...we will email you a search alert within 2 minutes† of a matching‡ item appearing on eBay. Buy Now Search also includes local, postal (zip) code based, search features. We also enable enhanced features and multiple searches if you buy our excellent value search credits. More information about buying and using your search credits. An Android App enabling you to register with Buy Now Search and manage your free search is available (this cannot be used with the enhanced, paid for, account). It is also available for Android and Kindle Fire from the Amazon Appstore. * fixed price items are items that are listed with a fixed price - such as Buy it Now, Basic Fixed-Price, Store Inventory, Ad Format, and Classified Ad (Classified) listings. However, you will not be notified for Multi-variation items - these are excluded from our searches. † We will send the email within three minutes of the item being listed on eBay (see this FAQ item), sometimes this is minutes before the item can actually be found on eBay. The time that you receive emails that we send to you, depends upon the speed with which a) email is processed by your provider, b) your email software picks up and displays new mail, c) availability of your email provider's DNS records, etc. 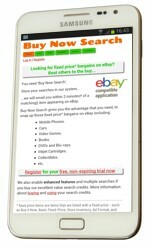 ‡ Our searches differ from searches on the eBay sites. Read our FAQ for more information.